Cultural heritage institutions are increasingly involved in community scanning days or similar events designed to engage with their patrons and stakeholders by offering to scan items held in personal collections. 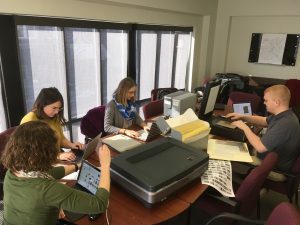 The North Carolina Digital Heritage Center is funded to digitize and provide access to collections owned by institutions; however, we also strive to meet our partners’ needs and to share our digitization and metadata expertise. Have a phone call or in person meeting beforehand to talk through best practices for a successful scanning day. Have an in-person meeting with staff to go over best practices for digitization, recording metadata, and ensuring that appropriate rights and permissions are gathered at the event. Volunteer to scan materials at the event. Host up to 250 photographs or 500 scans per institution as part of a “Community Heritage” collection available through DigitalNC.org. If an institution would like to take advantage of hosting on DigitalNC, talking through best practices and meeting with staff (1 and 2 above) must be included. Even if no hosting is needed, we’re still happy to offer guidance or volunteer at your event. Institutions who are requesting that the Digital Heritage Center provide a letter of support or partner for a community scanning grant, such as National Endowment for the Humanities Common Heritage grants, will at minimum need to have a phone call or in person meeting with Digital Heritage Center staff beforehand.